Designs for product and silo pressure relations, tested product flow characteristics and efficient as well as effective interfacing. The only silo technology company that designs silos and hoppers for product flow requirements, structural design and verification, detail drafting and proper interfacing of all feeder and discharger types. Complete engineering packages available for - properties testing - design geometry for flow - structural verification, detail drafting and equipment interfacing. 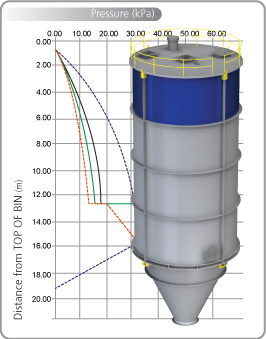 Solutions for bulk solids and powder flow problems. Elimination of ratholes, silo bridging, cohesive arching, unreliable and poor product flow, segregation and degradation of product. Design, problem solving and bulk materials handling solutions for all feeders and silo dischargers, live bottoms, bulk materials handling and conveyor equipment, inloading and outloading systems, batching systems, loss in weight systems, silo blending systems and process evaluation. Structural design and verification. 3D Modelling and detail drafting. Onsite or in house. We are the only company with on-site bulk solids and powder flowability testing capacity for more accurate and faster results for evaluation of problematic and free flowing bulk solids and powders. We provide quicker and more cost effective results making product flow properties testing for upfront engineering and process design more practical.